Wondering how to set up a secret Santa gift exchange? 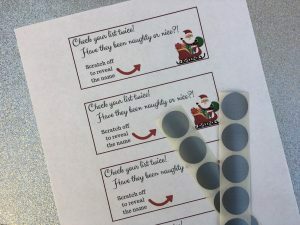 Secret Santa can be a fun game for co-workers at the office or families that don’t want to buy for everyone. 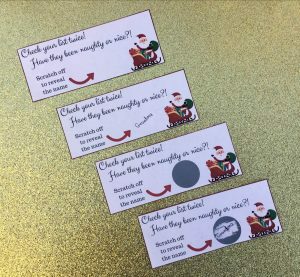 Put a new twist on the game by using these fun secret Santa printable scratch off cards to reveal who each person is shopping for! If you’re unfamiliar with how to conduct a secret Santa gift exchange it generally goes something like this. Put each person’s name into a hat or use my fun scratch off cards! More on that below. Each person picks a name and makes sure they didn’t draw their own. The organizer writes down who everyone drew in case of dropouts, illness, etc and gives them the person’s questionnaire, if you’re doing them. You set a date and a maximum spend amount for gifts. Gather on the assigned date and exchange gifts. You can keep the elves a secret or reveal them at the party! You can use a hat as your secret Santa name picker method but that’s been way overdone. These printable scratch off cards can bring a new twist to the game! Print out the number of cards you need. You can print it on paper but I’d suggest printing them on card stock so they’re a little sturdier. Hand out one card to each person, let them choose one at random, let them pick them off a tree, whatever creative way you choose. 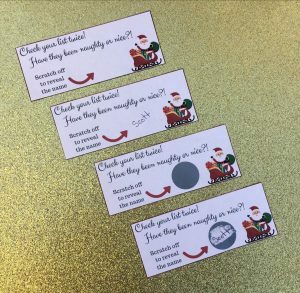 They can scratch off the circle to find out who they are playing secret Santa for! Continue on from #5 up above! Perfect for work or family events! Now go check out my Gift Guide page for gift ideas for everyone on YOUR list!